NEW YORK, NY--(Marketwired - December 10, 2013) - Nestled in the shadows of the Hollywood Hills, the famed celebrity haunt Sofitel L.A. was the sparkling location for Premier Traveler's (PT's) Best of 2013 Awards Gala on December 5, with representatives of the world's top travel companies in attendance. Not only were the winners (determined exclusively by PT readers) announced to the public for the very first time, but attendees also witnessed the official unveiling of the highly anticipated December 2013/January 2014 issue of PT, complete with an in-depth feature story that explains how each of this year's prizewinners beat the competition. Reflecting the increasing world focus on South Korea and its burgeoning travel industry, several South Korean companies in particular were among those bestowed "Best of" titles from PT readers. In recognition of its ongoing efforts to provide the highest-quality service in the skies, Asiana Airlines was awarded three top spots - Best Flight Attendants in the World, Best In-Flight Service in the World (both for the second year in a row) and Best Transpacific Business-Class Service. PT readers praised the airline for its focus on excellence in providing business travelers with the amenities and services that can ease the stress of long-haul travel. Asiana's Executive Vice President, Corporate Support, Mr. Tae-Keun Han, expressed his pleasure at the announcement of the accolades, saying, "Our corporate philosophy is centered around doing more for our customers whenever possible. From unparalleled comfort for travelers in our lounges and planes, to added experiences that show we're not afraid to think outside the box... Asiana Airlines will always be thinking of new ways to make our customers happy, which is why everyone at Asiana Airlines is pleased and honored to have earned these awards." In addition to praising the new Asiana business-class lounge in Incheon Airport - which aims at providing the services travelers would expect from a five-star hotel - PT readers also recognized the excellence of the airport itself by dubbing it the Airport with Best Duty-Free Shopping. With South Korea becoming more and more of a world-class business meeting destination, PT readers commended the Korea Tourism Organization (KTO) by awarding it the title of Best Meeting Destination in the World for the KTO's efforts in aiding companies that hold their most important business gatherings in the trending country. Not to be outdone, South Korea's flag carrier, Korean Air, was also heralded by PT readers, who named the airline the Best Airline in Asia for its continual innovations in service and amenities. The carrier was also lauded as the airline with the Best A380 Layout, with readers hailing not only Prestige Business Class, but Korean Air's ingenious onboard Celestial Bars, which allow elite-class passengers to sip their way through long-haul journeys. "Our A380 flight is a game changer in every market it serves: New York, Atlanta and now twice daily from LAX, and we offer service to Asia that no one else can meet," said John Jackson, Korean Air's vice president for the Americas. 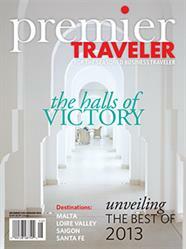 "We are honored that Premier Traveler readers have voted Korean Air Best Airline in Asia and Best A380 Layout." Back on the home front, Marriott won Best Hotel Chain in North America, for providing domestic travelers a place to hang their hat and plug in their many devices, whether they're attending a corporate meeting, holding a special event or seeking shelter from the storm. When luxury travel doesn't fit the bill, an economy flight might be in order, and PT readers donned Southwest Airlines the Best Low-Cost Carrier in America, for its focus on making economy travel not only more tolerable but often enjoyable. Families with children, in particular, love the fact that they don't have to dip into their flight's baggage allowance in order to check a child's car seat or stroller. Innovative ways to earn loyalty points and miles is a favorite subject with frequent flyers, and Capital One captured the gold by winning Best Credit Card Rewards Program in the World for its Venture card, which allows travelers to earn double miles and offers easy redemptions via the company's Purchase Eraser. Keeping in touch is an even more important necessity for travelers these days, and PT readers dubbed AT&T the company with the Best Mobile Phone Coverage in the World for keeping the lines of communication open for road warriors far from home. Said Adam Rodriguez, PT's executive director, "We are immensely pleased with the outcome of the awards this year. Our readers can offer a keen insight into the realities of global travel, and they've responded in record numbers to award the companies that have served the frequent business traveler with distinction."